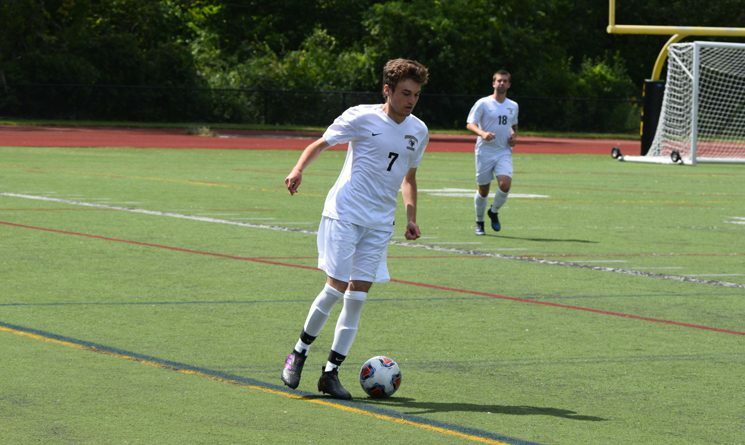 WORCESTER – The Framingham State University men’s soccer received a pair of goals from junior Bryce Nardizzi as the Rams defeated Worcester State University 4-1 Saturday afternoon in Massachusetts State Collegiate Athletic Conference action at Coughlin Field in Worcester. Nardizzi, a Framingham High product, is a junior and has a dozen goals this season. With the victory, Framingham State is now 10-502 overall and 4-0-2 in the Conference. Worcester State falls to 6-7-2 overall. A Worcester State foul in the box in the 33rd minute led to a penalty. Senior Ken Stahovish took the kick and sent it to the bottom left corner evening the score at 1-1. Another Worcester State foul led to the Rams second goal of the contest as Nardizzi converted a free kick from 30 yards out in the 43rd minute for the 2-1 lead. Nardizzi and sophomore Akeem Bucknor added insurance markers for the Rams in the second half to help secure the victory. The Rams held a 15-10 advantage in shots for the game including 7-3 in the first half. Each team attempted three corner kicks in the game. Corey Davidge earned the win in net for the Rams making just one save, while Henri Guilmette took the loss for the Lancers and made four saves. The Rams have reached the 10 victory mark for the first time since the 2010 season when they went 11-10-1 on the year. The Rams host Lasell College on Wednesday for a non-conference at 4:30 p.m.